By default, the crane in the KRANBAHN module extends beyond the ends of the carrier. How can I stop this? 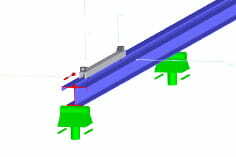 To determine the maximum support forces, it is often necessary for the crane to be able to travel beyond the support to be dimensioned. This ensures that z. B. in an asymmetrical load distribution and really every wheel crossing the respective critical point of the carrier. Arrangement of the buffers can be described via the button in a dialog (see Figure 1). There is already an interesting webinar on the topic of " Designing crane runways according to Eurocode 3 ".